Hi Trevor ... glad to have you back and sounds like the knee ops have gone well, excellent news .. just take it easy and build up the strength well. 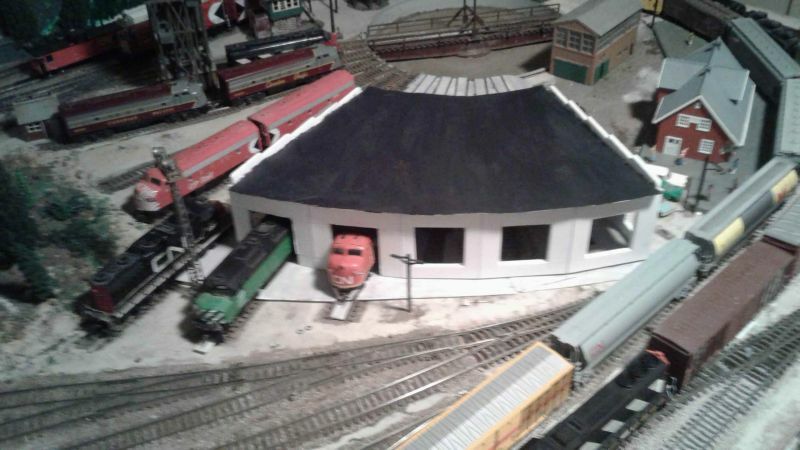 I took time to review your post from the start and great progress on the layout ... especially considering the house move and hospitalisation imbetween. It certainly is impressive already so once complete, wow ! The last few days have been spent adding the roof to the round house and rebuilding the mainline throttle... partly because the rectifier and capacitors did a bit of a bunk. Ordinarily it would not be too big a job but what I have found is that the components do not necessarily drop in and it seems a while to get the same running characteristics as the throttle was before. While doing a bit more testing, I took the effort to get further down the track with the round house. A side on view... 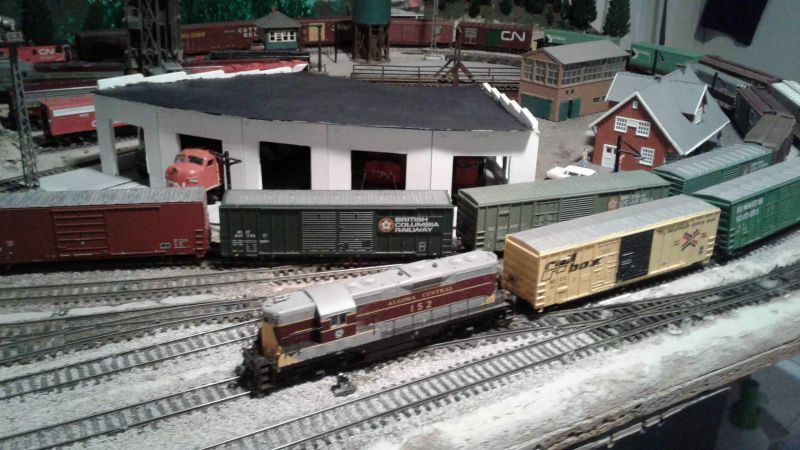 I am pleased with the way it has shaped up to the original which was a picture of the Bayshore shed in Saint John New Brunswick in the hope of getting a "Canadian" roundhouse building... or something which captures the feel of it. I will try to get permission to get a pic from the original source. AS I said, it has become a simile prototype given the lack of dimensions and modellers licence but I hope I ultimately do it justice! 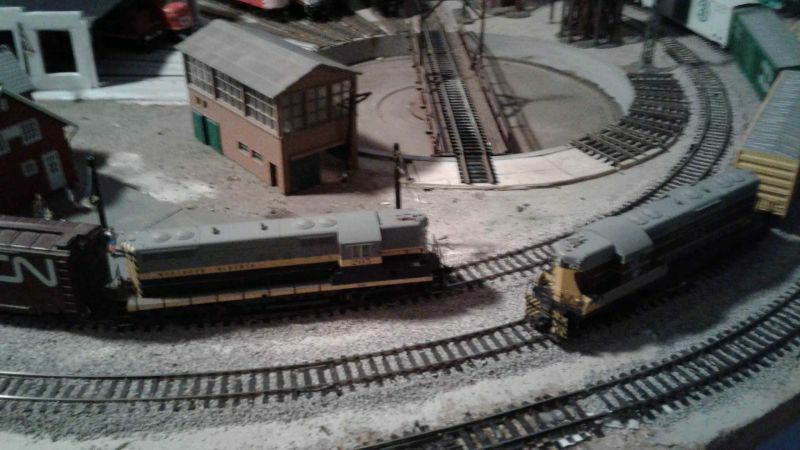 I have started going through the crates where the rolling stock has been stored and got out about the max level of freight cars that the layout can handle sans the "Vista" fiddle yard as it had in its old location. The concrete floor of the round house was painted with a lightened black ( or a darkened white while the roof was painted last night and the internal lights that were in a small engine shed were put on their own pedestal inside the building. As I pull out the locos, they are being checked and wheels cleaned and minor repairs made. I have about another 30 or so freight cars but there was a minor accident before packing and I have a few days work with things like broken coupler pockets and couplers, so I will repair at leisure. With 45 or so freight cars I won't have a problem and will learn to rotate cars as number of others I know. I will also need to rotate the motive power as I have 7 steamers as well as the 13 or so diesels so we will see. 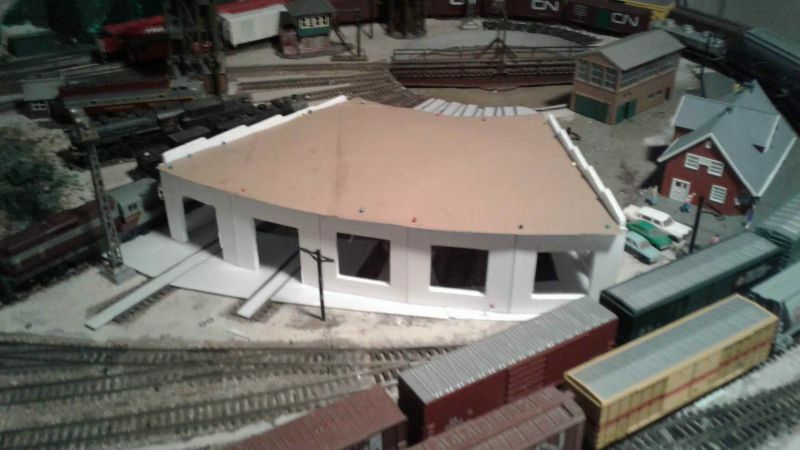 But operations are very very close and the roundhouse will get some additional work as the whim takes me. More to come and I hope you are still liking the progress which (like my knees) has been slower than I would like but still happening! I have a vague idea of where you are, I visited the refinery at Geelong ten years ago. All I really rembember are the peg people! Yes there are a lot of bollards around Geelong! Actually where we were prior to moving was closer to the refinery by road than it is here. Seeing the crow can fly across water, it is probably about the same. What I would be interested in is the comparison of layouts as you put it! Perhaps you could outline where they are different? I have just taken a few photos to add to the repertoire! The long suffering patient passengers have a railcar finally stop ... oh dear it is only a test run! But at least other trains can run now! The round house almost full! I have all but 1 and a half of the roads with locos in them which are currently out on the road. Certainly all the roads for freight cars apart from a couple of vacant roads to allow for shunting/switching etc have now been filled so operations, here we come! I was looking at how the infrastructure differs between here and you and how you’ve modelled them. The low stations, signaling and how buildings have a different style! Actually the differences in architecture etc fascinate me also. I was at one point the President of the Melton MRC ( for 4 years) and one of my unfulfilled ambitions was to base an exhibition layout on the local Melton Railway Station but make the buildings and platforms etc liftable and readily changeable so that an exhibition layout could be Melton Victoria in a morning session, Melton in Suffolk in the afternoon then Melton Missouri the next morning followed by Milton Ontario in the afternoon although the last could be a freelance Melton in Alberta with similar terrain to Melton where I used to live. The Melton Club were by number more interested in the local prototype but there are a couple of US interested modellers, I of course was Canadian based, and there were British interested modellers as well. Here in Australia, there is obvious links to British, European and North American influences depending on the area. 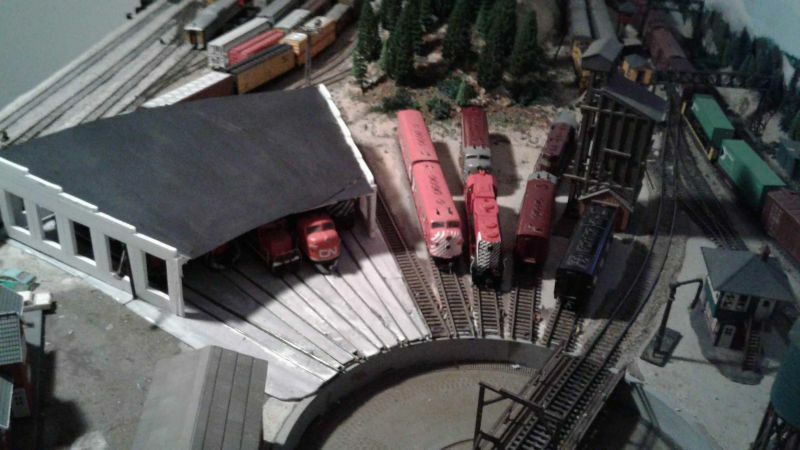 An acquaintance here in Melbourne changes his layout and rotates it every twelve months with different locos, freight cars, motor vehicles and some ( but not all) buildings to different 10 year time frames between about 1930 and 1970 meaning his layout is "recycled" every 5 or 6 years. It takes a bit of discipline but he does it! Anyway, I have actually started my operating pattern as of last night and marshalled my first way freight/transfer run since about last September... spent about 30 minutes or so very enjoyably! So there is progress but not much different to see from the pics above. Steady progress Trevor. The roundhouse looks great! Have you tried making trees? This method is fast and effective. I did try making trees years ago using a similar method and they would hardly have made believable pipe cleaners let alone believable trees so something was lacking in the technique. It ended up that a good (now sadly passed) friend made me about 60 or so using my materials... me and materials have never had a happy history!!!! Still I will try again but will more than likely renovate Tom's trees first and fill in the holes I have in the greenery! At the moment I am catching up with the operations stuff as well as doing any tweaks to get the rollingstock performance to an acceptable level such as wheel gauge, Kadee springs missing, coupler height etc. which would have moved during the move and storage over the summer/winter. It is nearly 12 months since I last operated the layout as an operating railway with the imaginary division point to division point so it is almost a new experience all over again and yes I am enjoying the journey, getting the stock and track right as can be got. But I will try some more adventurous stuff including some of my own trees ( I will get that right!!! ) and other aspects to change some other parts of the layout... it's a hobby mate!!! I will send some pictures soon of some operations which at the moment are diesel themed! I have been having fun operating which you can see some examples of here but also doing tweaking of minor stuff with track etc. With the "recovery" mode, I have not had as much time as I would like but doesn't that affect all of us? I have used .020" / .8mm sheet styrene offcuts to pack under the track which is enough to create the sense of elevation without looking like Scalextric banking blocks. The incoming train would be doing about 8-10 smph before coming to a halt further around the curve, courtesy of the inertia controller. 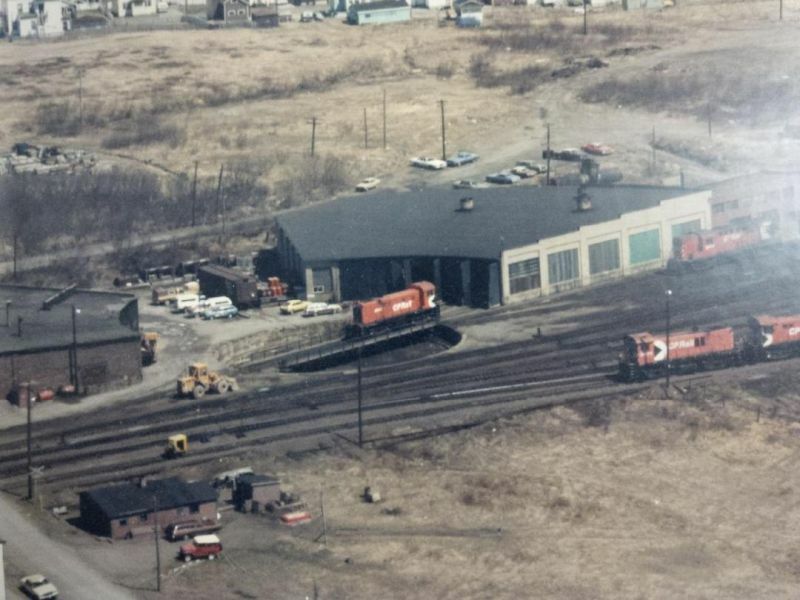 An aerial view of the Loco Depot with all but two places (the NAR and ACR units in the previous pic) taken up. Spadina/John St in Toronto it is not, but it brings back memories of my trips through Toronto over 40 years ago. 152 has arrived with its load and will uncouple to head to the depot and return "East" later on. Northern Alberta 205 will proceed on the mainline outer track East Bound. 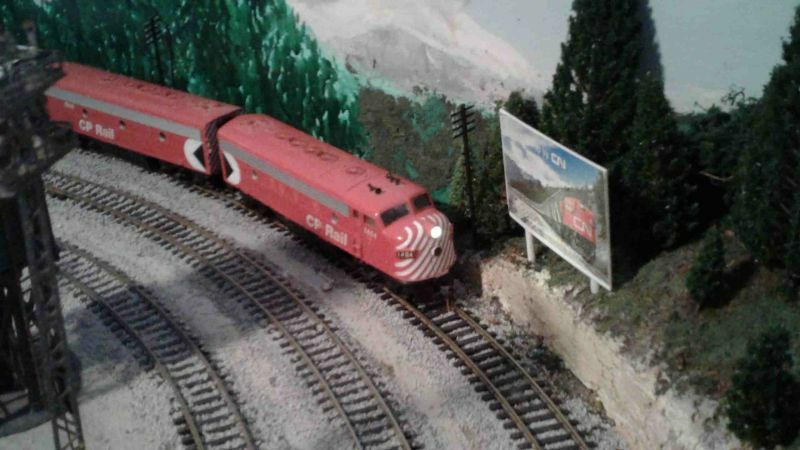 This train will be shunted and reorganised with a new locomotive and caboose/van before heading West pretending that it is originating at the "Ridgehaven" part of the line which 205 will cross. 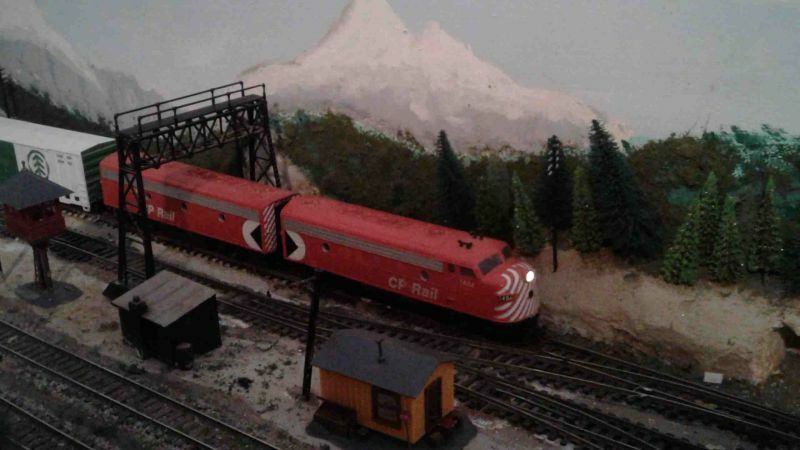 In the meantime, 205 will pull into "Ridgehaven", after completing 3 stops and 50 laps which is about 15 scale miles ( but who is counting) emulating the in between stations. No train just goes in the one direction but it is the only way I can get the sort of mileage I would like my trains to run. Eventually all the rollingstock will also travel in both directions as they are switched out from which they could go in either direction. 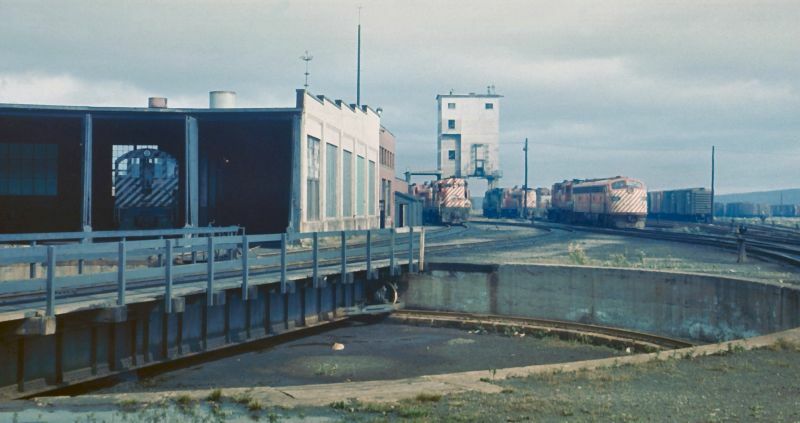 Actually, this engine is facing East in real life but this direction was West in the layouts original location. It later faced North, West and South in different locations in our old house. 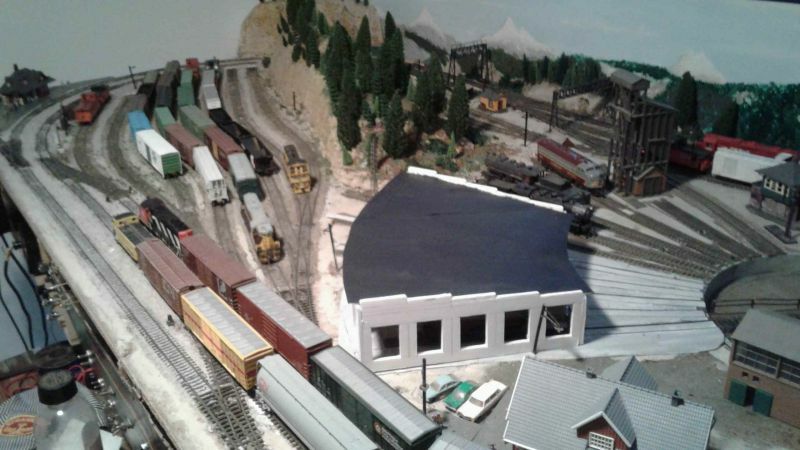 I have been busy with just about everything except the Railway for about a month or so as life seems to have caught up with me including a change in the rehab program etc. However on the hobby front, I have still been active by trying to get my website back up. Some of the pages seem to be working and then the links but the index page does not seem to be accessible. Hence I have lifted images from the old pages and started to create a new site at https://sites.google.com/view/stagnesrailway which only has two pages on it so far as I am hoping not to have to rewrite the lot. Following on from yesterday I have in fact made a cosmetic change that helps me operate within scale speed limits. About 3 or 4 weeks ago, I placed a number of telegraph poles so that they aligned with the track centres at 10 inch spacing. The idea was based on my scale speed method where a train passing a set distance in a given time. In HO scale, the distance in inches that a train covers in 5 seconds is equal to the scale miles per hour. I was using a set length of track at first then using spikes as a model of equally spaced siting pegs placed at 5 inch intervals. With the renovation, I have been back to using the length of track which at 38 inches gives me 35 smph just short of the length in 5 seconds, 40 just over. I installed a number of Telegraph poles around that align with 10 inch spacing at the track centre so they are not totally geometric in their spacing given that they are on the convex and concave sides of the curves around the back. Here is 1404/1909 Westbound on a through freight starting a sectional count. 5 Seconds later they are just over 4 poles away so the train is doing about 41-42 smph! I merely count 5 seconds out and you will be surprised how well you can do this. Each of the poles is equal to 10 smph for each on covered in 5 seconds. As the majority of you are in OO, the spacing for the poles would be 11.5 inches apart, in N they would be 5.5 inches apart. 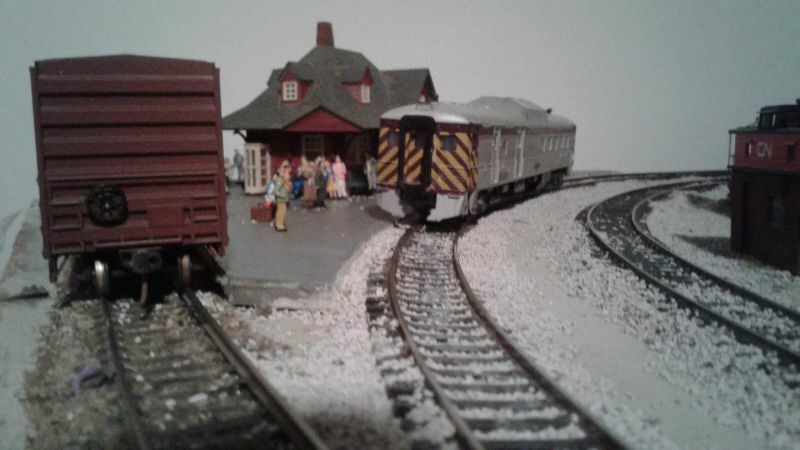 In O scale 1:43.5 , they would be 20.25” while in O scale 1:48 they would be 18.35” apart or about 18 and 3/8” . The system has worked well for me over a number of years and it should for you too! Good to see the layout coming to life after the move. I am intrigued by your use of a rotary switch for the turntable - is that for power to the tracks or for moving the TT? Love the scale speed idea. Will definitely borrow that one! Thanks for the feedback... appreciated! The Rotary Switch is 12 position and I have 10 Turntable Roads. So 12 o clock is off and the positions of the clock power Roads 1 - 10 with 1 spare position. I still use DC because I like my throttles braking realism too much although I can see the advantages of DCC in terms of some of the operations I would like to emulate. Hope that helps and I hope others like the scale speed idea! Sure beats trying to see some micro device in a box car door and actually it emulates what drivers/engineers do when they are checking the accuracy of the speedo as I have witnessed several times. Ah! Yes, that makes sense, and a smart idea. Can I ask what TT you have? I am planning to incorporate one myself but the choice seems to be cheap (but lots of electrics to do) or very expensive! I have gone down the DCC route for my first "proper" layout. Played with trains as a child, on the dining table - very envious of a friend who had a Hornby plan on a board! Promised myself a layout one day.... when I thought that day had come, everything had moved on from emulsion paint and coloured sawdust, so made a couple of planks just to get my eye in and learn some new techniques. Now Faversham is underway! I'm sure I won't be the only one following your speed guide - and I love your visual clues. Great to see how you have developed your idea. Layouts are never finished are they? The Turntable is a Heljan one- it is not motorised as the gear wheel underneath perished but it is over 35 years old! I will motorise again one day ( got a suitable motor and drive, just need to be able to get safely under the layout and out again as the knees are still not 100% of what I think they should be! The Heljan TT is long enough to take a double F unit but I doubt you would need that much. Maybe a Dapol one modified with a Headphone jack as a spindle might be closer to a BR appropriate size? The spindle with one of those auto reversers should save a bundle of wiring. I have a reversing switch for mine but it is easy to manage! With an unwell mother interstate, rehab from the operation, still unpacking and sorting 38 years of accumulation plus in the old house, and... well you know the drill! The layout has been great for 5 minutes plus ( the longer the plus the better) stress relief etc but I feel that I cannot get under the layout easily enough to get the lights rewired etc so that the signals work etc. Hi Trevor. 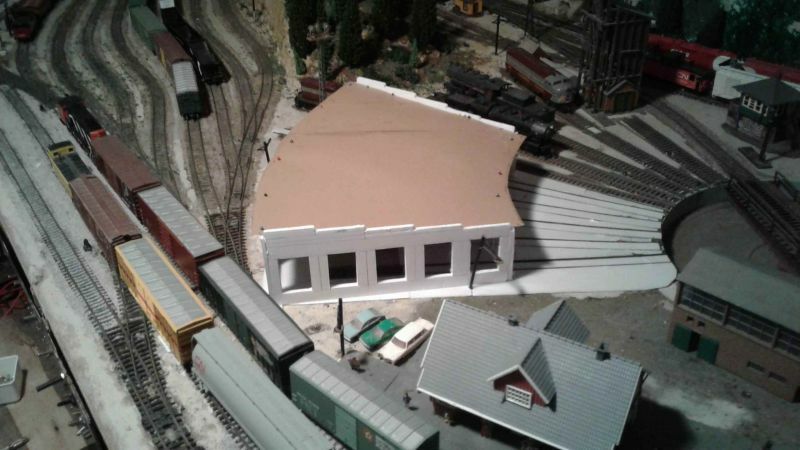 Great photos of the renovation and the engine shed is a cracking start to a new build.